The first stamps of the Austrian Empire to feature the profile of the emperor appeared between 1858 and 1859. These new postage stamps were taller than the previous ones, and they featured an ornate, colored, oval design, with the embossed profile of the emperor in the center. In 1863, the profile of the emperor in the central design was replaced with that of the Austrian Imperial Coat of Arms. Designs similar to the issues of 1860 to 1864 were also issued for use in Lombardy and Venetia, but they are all denominated in SOLDI, instead of KREUZER, at the top of the oval. 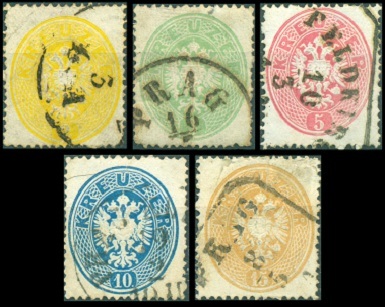 The five definitive Austrian Empire stamps shown above were issued during December 1860. These stamps are perforated 14. The common design features colored oval frames, along with the embossed right-facing profile of Emperor Franz Josef I. The Michel / Scott catalog attributes are as follows. The shades used below are from the Michel catalog. 02 K. (1860 - Mi. #18, Sc. #12) - Light Yellow, Yellow. 03 K. (1860 - Mi. #19, Sc. #13) - Light Green, Dark Green. 05 K. (1860 - Mi. #20, Sc. #14) - Pale Red, Dark Red. 10 K. (1860 - Mi. #21, Sc. #15) - Light Brown, Dark Brown. 15 K. (1860 - Mi. #22, Sc. #16) - Light Blue, Dark Blue. Government reprints of these stamps were made for collectors, between 1866 and 1887. These mint condition reprints exist in five different printings. Some are actually much more expensive than the original stamps, but most of them are relatively affordable. The perforation gauges of the reprints range from 9 to 13 1/2. There are also imperforate reprints of the 2 Kr. and 3 Kr. denominations. 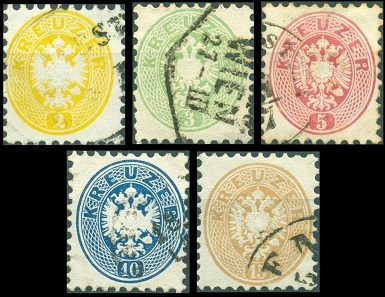 The five re-designed definitive Austrian Empire stamps shown above were issued on July 1, 1863. These stamps are perforated 14. The common design features colored oval frames, along with the embossed Austrian Imperial Coat of Arms. 02 K. (1863 - Mi. #24, Sc. #17) - Light Yellow, Yellow. 03 K. (1863 - Mi. #25, Sc. #18) - Yellowish Green, Dark Green. 05 K. (1863 - Mi. #26, Sc. #19) - Rose, Carmine Rose. 10 K. (1863 - Mi. #27, Sc. #20) - Light Blue, Blue. 15 K. (1860 - Mi. #28, Sc. #21) - Light Brown, Dark Brown. The five Coat-of-arms-type definitive Austrian Empire stamps of 1863 shown above were re-issued in 1863 and 1864. These re-issued stamps are perforated 9 1/2. Stamps printed after July 1864 were the first ones to use paper with the "BRIEF-MARKEN" press-sheet watermark, though about 80% of the stamps in the press-sheets show no trace of a watermark. 02 K. (1864 - Mi. #30, Sc. #22) - Light Yellow, Dark Yellow. 03 K. (1864 - Mi. #31, Sc. #23) - Light Green, Dark Green. 05 K. (1863 - Mi. #32, Sc. #24) - Rose, Dark Carmine Rose, Carmine Red. 10 K. (1863 - Mi. #33, Sc. #25) - Light Blue, Greenish Blue. 15 K. (1863 - Mi. #34, Sc. #26) - Light Brown, Dark Brown. The 2 Kr. and 5 Kr. denominations also exist on ribbed paper, and they are very scarce. Bisected examples of the 2 Kr. and 10 Kr. are known on cover, and they are very rare, with prices in the thousands of Euros. Other collectible varieties of this 1863-1864 issue include red, blue, violet, green, and orange cancellations, Lombardy-Venetia cancellations, and stamps postmarked at Austrian Imperial post offices in the Turkish Empire. Government reprints of the Coat of Arms issues were made for collectors, between 1884 and 1894. These mint condition reprints exist in four different printings, and they are inexpensive. The reprints are perforated 10 1/2, 11 1/2, 13 and 13 1/2. There are also imperforate reprints of the 2 Kr. and 3 Kr. denominations. 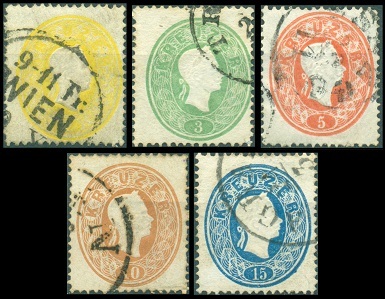 Used examples of most of the oval definitive issues of 1860 to 1864 are relatively inexpensive, and they can provide the basis for a very attractive Austrian Empire postmark collection. The two Austrian Empire newspaper stamps shown above were issued between 1861 and 1863. These newspaper stamps are both imperforate. 1.05 K. (1861 - Mi. #23, Sc. #P7) - Light Gray, Dark Gray, Gray Violet, Dark Lilac, Brownish Lilac. 1.05 K. (1863 - Mi. #29, Sc. #P8) - Gray, Gray Brown, Gray Violet, Brownish Lilac. 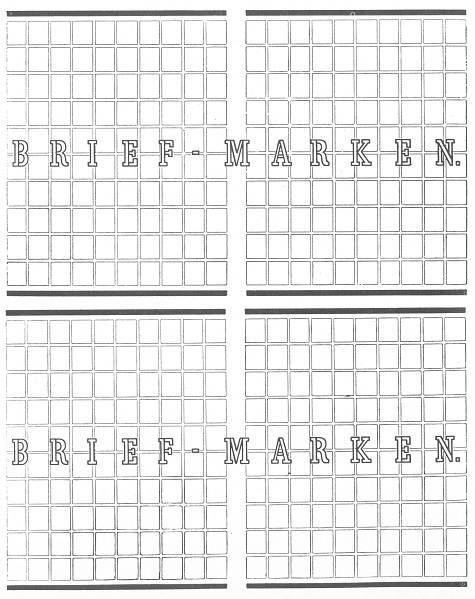 Beginning in July 1864, the paper used to print Austrian stamps was watermarked "BRIEF-MARKEN", in double-lined capitals, across the middle of the two horizontal panes of each press-sheet. The letters are very large, and presuming proper alignment, the portions of the letters appear on between eighteen or twenty horizontal positions of each pane of stamps. Of course, the location of the paper watermark can be variable, (up, down, left, or right), depending on how the paper was aligned on the printing plate. The 1863 newspaper stamp shown at the bottom of column two has a very similar type of press-sheet watermark. However, the watermark on the newspaper stamps reads "ZEITUNGS-MARKEN".